Many people who come to come to Korea will at some point want or need to send money back to their home country. Whether it be to pay loans, add to a savings account, or some other necessary transfer, there are a few options. With each option comes pros and cons. Wire transfers are the quickest and most secure way to send money from Korea. This is the most popular and most well known option among foreigners. It is very simple to do, and you will need up to 7 things in order to send money via wire transfer. Money (sorry if that was too obvious). A Passport and ARC (Alien Resident Card). With this they will keep track of how much money you are sending back to your home country (there is a limit that is probably well above your income level). Your home bank’s SWIFT code. This is an international code that allows each bank to send money to each other. Your bank account number from your bank at home. The address of your home bank. The routing number of your home bank ( you might not need this, but it is best to be prepared). Your Korean address and phone number. To complete a wire transfer simply go to your bank with the above items. When it is all boiled down, the pro’s of a wire transfer are the speed and the security. The con is the cost. There are three types of fees when it comes to wire-transfers. First, there is the outgoing fee; in Korea this is pretty low depending on the bank. Second, there is an incoming fee. This is charged by your home bank. This can range between $10 and $30 USD (it depends on your bank and account type). Third, there may be a middle bank fee. If your Korean bank does not have a direct connection to your home bank, the money may have to pass through a third bank’s hands. This bank takes a fee for it’s service. Here is an example: Someone sends ₩2,200,000 home (about $1,900 USD at the time). That person is charged about ₩15,000 as an outgoing fee from the Korean bank. Later they find that they were charged $20 from their home bank. Much to this person’s disappointment, they learn that another $20 was taken by some middle bank. Including the Korean outgoing fee, the total fees arrived at about $52 or about 3% of the amount sent. That may not seem like much, but it is more expensive than the next option. For wire-transfers I would suggest KEB (Korea Exchange Bank), they often have more favorable rates and fees for international transactions. This option is the cheapest, and relatively quick. First, we’ll explain what a bank check (or cashiers check) is. This is a check that you get from the bank; you give them money, and they write a check from the bank to the person that you want to pay (in this case the bank will write the check to you). This may cause some confusion at first with the bank tellers, but after a few transactions they should get used to the process. The idea is that you get the bank check, or cashier’s check from a bank and mail it to your home bank via EMS shipping (EMS is registered, trackable, and very secure). 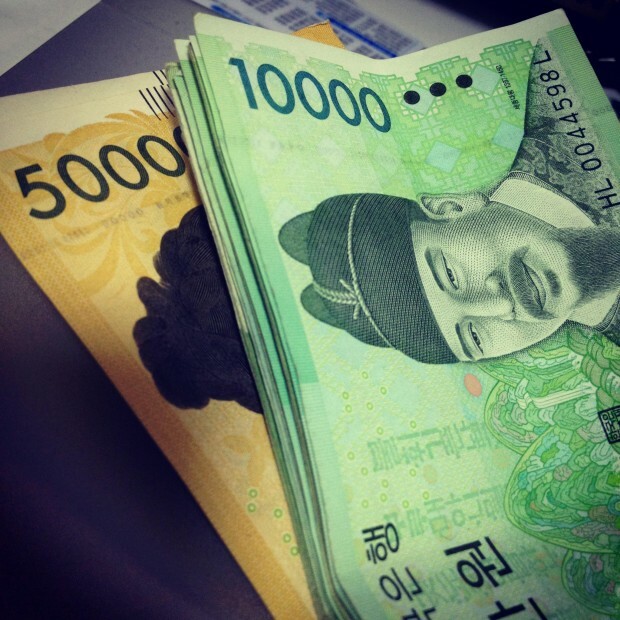 The bank check usually costs between ₩10,000 and ₩15,000, and the EMS costs about ₩19,000. That makes a total of about ₩34,000, or $32 USD. The shipping time usually takes about 3-4 business days if it doesn’t end up in a routine customs check (in that case it can take around a week). If you do choose this option, be sure to ask the bank if the check can be voided if it is lost (and make sure the money will return to your account). You could also send travelers checks, but that is risky since travelers checks need to be signed in order to be cashed. This means that if your checks fell into the wrong hands, they could be spent if signed. Also, most travelers checks state that they are not to be mailed. We do not recommend mailing travelers checks. This is not a bad option if you happen to be headed home. I believe that there is usually a $10,000 limit per person when transporting money on a passenger flight. The biggest problem with this is the stress of worrying about your money the whole flight. If you do chose this option, do not check-in your bags with money in them. Even if they want to gate-check your carry-on, do not let them put it under the plane. NH (Nyong Hyup) has an Overseas Remittance Service for foreigners. This is option may be convenient for teachers who already have an NH account set up for receiving pay from their schools. The Overseas Remittance Service is a special bank account directly connected to another bank account overseas. When you deposit money into this account from Korea, it automatically transfers money to your home bank account. This is different than a wire transfer because you don’t need to visit a bank teller or use online banking to complete the transaction. However, it is similar to a wire transfer because it transfers money to another account and there are fees. To set one up you will need to visit the main NH branch in downtown Jochiwon, with the same items you need for a wire transfer. You will get a new bankbook for your new account. You can transfer money into your special account anytime from the ATM machine and the money in this account will automatically transfer overseas four times a day at 12 p.m., 2 p.m., 4 p.m., or 7 p.m.
Last, Citibank is offering one more option. Citibank is offering free wire-transfers to Citibank branches in the US. If you have a Citibank account in the US, this might be worth looking into. Remember, with any transference of money, be cautious. It is better to go the steady and secure route rather than one that is cheaper and less secure.